Martin Luther's thought continues to challenge people throughout the world in the twenty-first century. His paradigmatic shift in defining God and what it means to be human left behind a foundation for viewing human creatures that was anchored in Aristotle's anthropology. Luther defined the Revealed God in terms of his mercy and love for human beings, based not on their merit and performance but rather on his unconditioned grace. He placed 'fearing, loving, and trusting God above all else' at the heart of his definition of being human. This volume places the development and exposition of these key presuppositions in Luther's thinking within the historical context of late medieval theology and piety as well as the unfolding dynamics of political and social change at the dawn of the modern era. Special attention is given the development of a 'Wittenberg way' of practicing theology under Luther's leadership. It left behind a dependence on allegorical methods of biblical interpretation for a 'literal-prophetic' approach to Scripture. More importantly, it placed the distinction between the 'gospel' as God's unmerited gift of identity as his children and the 'law', the expression of God's expectations for the performance of his children in good works, at the heart of all interpretation of the Bible. 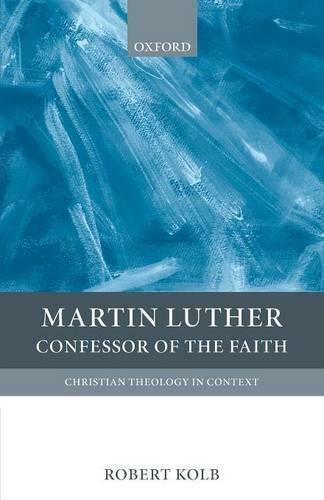 This presuppositional framework for practicing theology reflects Luther's personal experience and his deep commitment to pastoral care of common Christians as well as his reading of the biblical text. It is supported by his distinction of two kinds of human righteousness (passive in God's sight, active in relationship to others), his distinction of two realms or dimensions of human life, and his theology of the cross. The volume unfolds Luther's maturing thought on the basis of this method.